The Business-Centre-Hotel is located in administrative, business and shopping centre of Arkhangelsk. The hotel occupies 12 floors of a high-rise building and offers accommodation in 22 rooms including 6 Suites and 16 Standard Single rooms. Each room features a minibar, a telephone, and a hair-dryer. There is a restaurant on the third floor of the hotel, where meals of Russian and European cuisine are served. A banquet hall with a capacity of 50 persons may be used for organizing festive events and parties. The hotel has its own heating system. All types of modern communication services are available at the hotel. The Business-Centre-Hotel features a reception room for holding conferences, negotiations, seminars, banquets and other events. 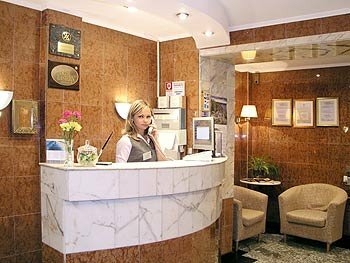 Other facilities of the hotel include: a business centre, a meeting room, a luggage room, laundry and dry-cleaning services.